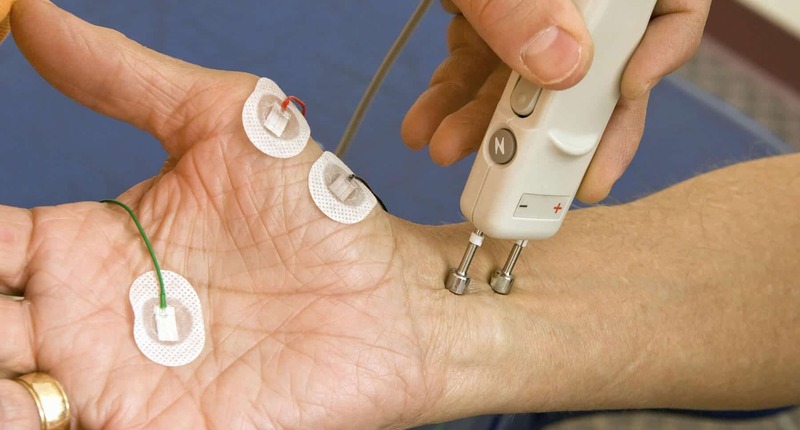 What are nerve conduction studies & electromyography (EMG)? Nerve conduction studies are electrical tests which involve the stimulation of nerves along several points (usually as they run down the arms or legs). Surface electrodes (small thin metallic discs) are used to deliver and detect the electrical impulses. The strength of the impulse and the speed at which it travels are examples of a number of characteristics measured. EMG is often done at the same time, and is a way of recording the electrical activity produced by muscles. What conditions can they diagnose? Nerve conduction studies are safe and generally well tolerated. Patients typically experience only minor discomfort. Long term side effects occur rarely, if ever. Most patients describe the feeling as a ‘tingling’ or ‘tapping’ sensation. What precautions should I take beforehand? You should avoid topical creams as these may increase skin resistance to the applied current, and therefore require stronger levels of electrical stimulation. In colder environments, the arms or legs may need warming as cool peripheries slow the conduction velocity of nerves and may affect the results. No fasting is required. You can return to normal activities such as work, driving and sports immediately afterwards. You may continue to take all of your usual medications before and after the tests. Where are nerve conduction studies & electromyography performed & how long do they take? These tests are performed at a Precision Brain, Spine & Pain Centre consulting location, by one of our specialists. Typically, they take between 15 minutes and an hour, depending on the number of sites requiring testing and the complexity of the clinical presentation. Frequently a clinical examination is performed at the same time to add further diagnostic value. A Medicare rebate is available for the study and varies depending on the complexity of the study and the number of nerves examined. The out of pocket costs therefore vary, and will be estimated at the time you book your appointment. Workers compensation and transport accident patients require prior approval from their insurer, and do not have out of pocket expenses. Military and DVA patients also do not have out of pocket expenses. Want to learn more about our nerve conduction studies? Please call our specialists at +61 3 8862 0000 or send us a contact request.